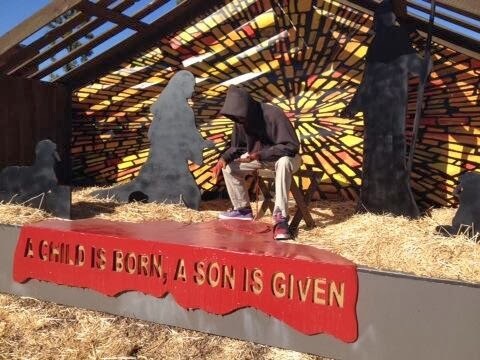 Claremont United Methodist church in California has erected a horrible "nativity scene" created by John Zachary which replaces the Christ child with a figure of Trayvon Martin. As you may know, Trayvon Martin was the African American teenager who was killed in self defense by George Zimmerman over a year ago in Florida. The case became a hot topic in regards to race and the court of popular opinion. Zimmerman was acquitted of all charges based on Florida's "stand your ground" laws. This caused an uproar among race baiters such as Al Sharpton and the Black Panthers. Zachary claims he created the nativity scene in order to "make the story of Christmas relevant in modern times." Excuse me? He has it wrong. All periods of times must be relevant to the Christ Child who was born to save the world. Trayvon Martin didn't die for our sins. He is no savior, only a kid who made some stupid decisions which got him killed after he tried to kill another man. This "nativity scene" -if I can call it that- is disrespectful and completely misses the point of the traditional display of the Nativity scene which was started by St. Francis of Assisi. It is meant to commemorate the birth of the Savior, not to make silly political and racially charged statements. Zachary is offending all Christians with this nonsense which displays Trayvon in his hoodie with bloody hands as blood pours from his chest. I hope many people complain to Claremont United Methodist and ask them to destroy this piece of junk. Shame on this congregation for allowing this stupid anti-Christ display that serves only to cause racial division and hate. Please take the time to contact this heretical sect and voice your anger at the disrespect that is being given to Christ the Lord.